The memory of this Saint is actually celebrated on March 30, but he is celebrated today because his book, The Ladder of Divine Ascent. 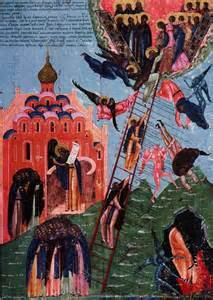 It was written by a great man exexperienced in all forms of the monastic polity about our our stepwise journey to Heaven: John Climacus. St John Climacus (τῆς Κλίμακος, “of the ladder”) was an older contemporary of St Maximus the Confessor(d. 662). He reposed about mid 7th century. He is best known because of his book, which discusses the meaning of the ikon (across) he made depicting the essence of his book. He also wrote the “Jesus Prayer” to aid those those climbing the ladder so that they can be in perpetual prayer as a ward again the demons that surround us and try to make us lose our step on the rungs. The ikona shows the importance of making a solid foundation for the ladder, for without that it cannot climb to Heaven, as unstable ground it will just fall down with the slightest weight. The ikona also shows that the climb is very difficult; the demons trying to pull the monks off & fall into the mouth of Hades swallowing up those who have fallen off because their faith was not as great as their aspirations. The angels are lamenting over those who have fallen, and below, the people on earth are all the while praying for those on the ladder. Christ is shown at the top of the ladder,waiting of us to enter His holy kingdom. Here are some excerpts from Chapter 1. “A Christian is an imitator of Christ in thought, word and deed, as far as this is humanly possible, and he believes rightly and blamelessly in the Holy Trinity. A friend of God is the one who lives in communion with all that is natural and free from sin and who does not neglect to do what he can.The self-controlled man strives with all his might amidst the trials, the snares and the noise of the world, to be like someone who rises above them. “Someone caught up in the affairs of the world can make progress, if one is determined.But it is not easy. Those bearing chains can still walk. But they often stumble and are thereby injured. […] [T]he married one is like someone chained hand and foot. Obviously St John believes it is best to be unhindered & thus unmarried like the apostles and Christ. It is still an argument that Christians have, of which is best with the Roman Catholics believing that all their clergy must be wedded only to the Church; while our Church, the Eastern Orthodox believes that is an option that one must make before they take holy orders. Alas that has been wigged a little as the Church has taken in all the Episcopal clergy in America fleeing as their Church had become infiltrated with a very strong anti-Christian sentiment and promulgating things that Christ expressly discouraged. The argument there is of course they were married before they became Orthodox priests, but that is a sad statement to the many Orthodox men who have been discouraged in the Anglican stead. St John writes “Do whatever good you may. Speak evil of no one. Rob no one. Tell no lie. Despise no one and carry no hate. Do no separate yourself from the church assemblies [= liturgy]. Show compassion to the needy. Do not be a cause of scandal to anyone. Stay away from the bed of another, and be satisfied with what your spouse can provide you. If you do all this, you will not be far from the kingdom of heaven.” But these pieces of wisdom are very familiar. You can read the whole thing here. It is about 130 pages. I would recommend ready a Step a week to glean the most from it so you can contemplate it’s message. From on high didst Thou descend, O Compassionate One; to burial of three days hast Thou submitted that Thou mightest free us from our passions. O our Life and Resurrection, Lord, glory be to Thee. ← The Black Pope strikes again!